There is a vast multitude of playground equipment for schools and nurseries to choose from that will suit children of all ages. Small apparatus includes see-saws, slides, climbing frames, swings and roundabouts. 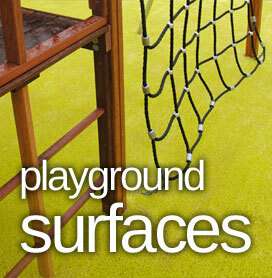 For large adventure playgrounds, there are climbing walls, towers, bridges, firemans pole and monkey bars. This section of School Playground provides detailed information on the types of swings and slides available. Swings are traditional playground equipment that never fail to exhilarate a child. Ensure that you purchase a swing that is suitable for your age group as younger children will require the extra support offered by a cradle seat (baby swing seat). For older children, a basic rubber seat is sufficient. Click below to read more about playground swings. Playground slides are an excellent feature for any school playground. Install a height suitable for your children’s age group as nursery slides are an excellent way to encourage young children to be adventurous while older children will gain more enjoyment from a full size playground slide. Click below to read more about playground slides.